These are often called American Salmonflies. 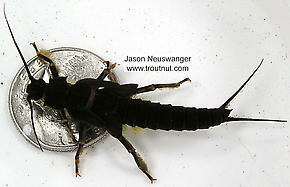 This is the largest common eastern stonefly. It's quite abundant in places, but not to the extent of its western counterparts, and since most of its activity is at night it is generally less important. Nevertheless, nymph imitations produce some very large trout, and lucky or very locally knowledgable anglers may find good fishing to the egg-laying adults.